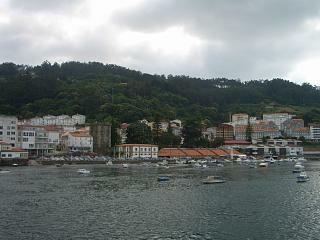 Pontedeume is a beautiful little town close to la Coruna city and it sits by the "ria de Ares" on an estuarial river. The areas between (and around) la Coruna and neighbouring city Ferrol are full of the stereo-typical Galician towns seen in tourist brochures and the old town of Pontedeume slips nicely into this category. 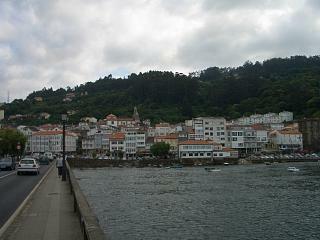 Left, a photo looking back at Pontedeume from the river. The old district of Pontedeume, which is quite picturesque, is built into the hill leading from the river with greenery above and a small but attractive little port area below. Our overall impression of this town was good and the small port, with a promenade and a number of little boats moored up, typifies most foreigner's image of the region. To add to the appeal a multi arched stone bridge separates Pontedeume from another tiny town on the opposing river bank. At the foot of Pontedeume sits an old stone tower, a relic of bygone days and a link with the attempted invasions by the Portuguese and British. Today though the town is at peace and it has a laid back and relaxed atmosphere with the visitors who choose to explore the town having an interest in culture rather than destruction. Right, the stone tower at the foot of the old town as seen from the bridge. 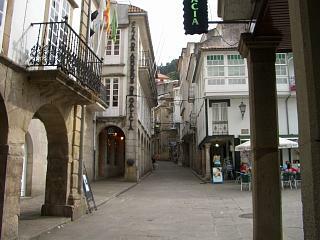 The streets and walkways that meander up the hill into which the old town is cut are mostly narrow and pedestrianised and near the top can be found the large church of Santiago. As with many town churches it is difficult to get an overall view of this building, partly because of the closeness of other buildings, but also because it appears to be mounted on its own little pinnacle. 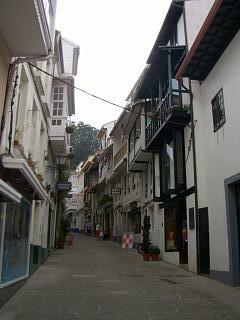 Half way up the slope into which the old quarter is built is a very attractive little paved plaza. This courtyard is occupied by the granite built town hall at one end with two opposing parades of buildings running away from and adjacent to it. Left, the entrance to a square in the middle of the old quarter. Today most of these buildings are now bars and this area seemed very much the hub of the old town. You are also left with the distinct impression that it is this little area that the majority of tourists and townsfolk alike find themselves drawn to when the heat demands a break or they want some refreshment. Elsewhere in the old quarter the winding side streets had plenty of shops to wonder around and all told this town looked like and ideal spot for tourists. There are some typical examples of small scale Galicia architecture, some original cobbled streets and the town is also used to foreign and English speaking visitors (see why below). On hill close to the town is the San Miguel de Breamo church, a building of Galician Romanesque design and about one kilometre away is a national park containing the ruins of an old monastery. The park is said to be an interesting walk in itself. Right, a church at thetop of the old town. Whilst in Pontedeume on Tuesday 11 July 2006, we bumped into a British couple from Kent who were with a party of UK vacationers staying in Pontedeume during a one week trip to Galicia. 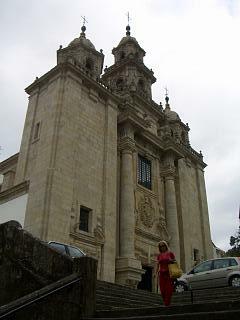 They told us that they were impressed with the town and that the group’s Galician excursion had been a success. 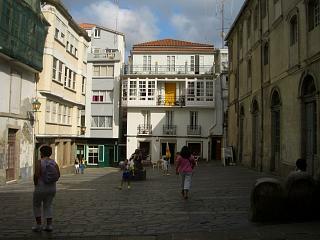 Below, another little plaza and street in Pontedeume's old quarter.